A map of Mars that includes the unusally high elevation region Louisiana State University researchers are studying called Thaumasia Planum. Click the image for a full-size version. Image credit: Wikimedia. Researcher Don Hood from LSU and colleagues at collaborating universities studied an unusual region on Mars — an area with high elevation called Thaumasia Planum. They analysed the geography and mineralogy of this area they termed Greater Thaumasia, which is about the size of North America. 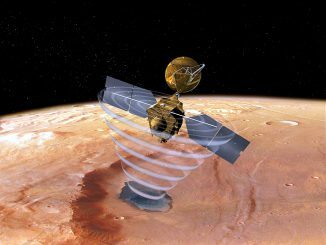 They also studied the chemistry of this area based on Gamma Ray Spectrometer data collected by the Mars Odyssey Orbiter, which was launched in 2001. What they found was the mountain ridge that outlines Greater Thaumasia was most likely created by a chain of volcanoes. The results were published recently in the Journal of Geophysical Research-Planets. “The chemical changes we see moving northwestward through the region is consistent with the mantle evolving on Mars. Our research supports that this whole area was built as a volcanic construct,” said Don Hood, LSU Department of Geology and Geophysics doctoral candidate and lead author of the paper. The chemical composition changes throughout the region. Silica and H2O increase and potassium decreases from southeast to northwest. “The chemical composition shifting is the key progression that tells us that this environment was most likely shaped by a series of volcanic events that continually erupted from a changing mantle composition,” Hood said. Hood and colleagues from Stony Brook University, University of Tokyo and Lehigh University ruled out another hypothesis that the abundance of H2O and potassium was caused by water interacting in rock. “We looked for evidence of aqueous alteration through other geochemical means and didn’t find it,” he said. The geography of the region has many shield volcanoes that are similar to the ones found in Hawaii. However, from geochemical analyses, the researchers found that the sulfur that is present was most likely deposited as a volcanic ash. Volcanic ash from various areas could be evidence of explosive volcanism on Mars, which would be an important clue for piecing together the history of Mars. It is significant because explosive eruptions emit a lot of gas that can stay in the atmosphere and can cause global cooling and warming events. “Whether there was explosive volcanism on Mars and how much of it there was is an important question in terms of finding out what the past climate was like,” Hood said. 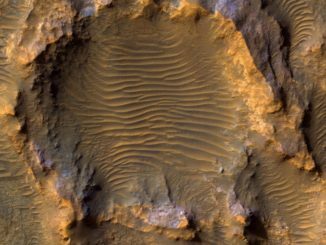 NASA’s Mars Reconnaissance Orbiter captures a spectacular enhanced colour image of an ancient crater on the red planet showing rippling sand dunes and eroded bedrock. 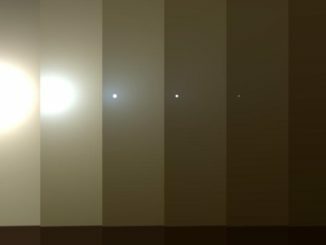 NASA managers are optimistic the agency’s Opportunity Mars rover will survive a huge dust storm that is preventing sunlight from recharging the robot’s solar arrays, knocking it out of contact with Earth.